The Paso Arts Fest was a good success for me! 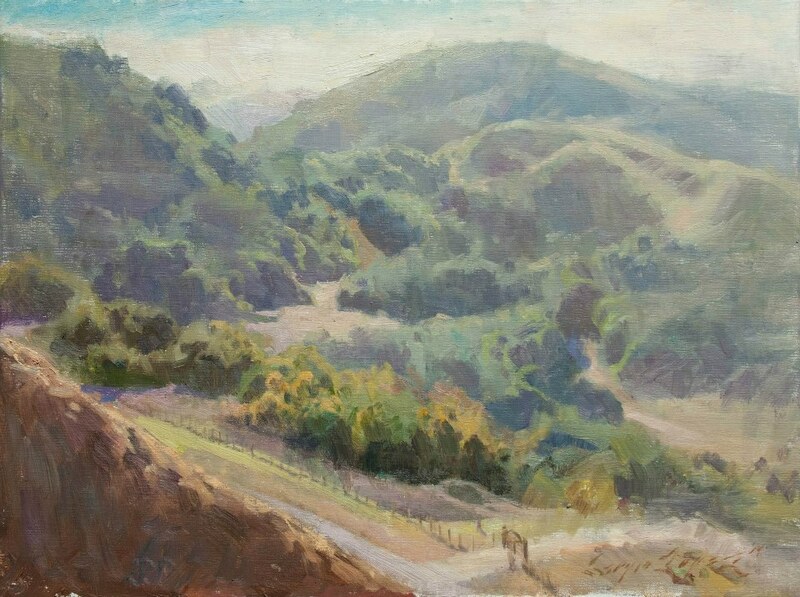 I had good sales, fun times with my plein air friends, and discovered many beautiful areas to paint in the San Luis Obispo area. I was invited by Anne Laddon last October to participate in this event. I had never heard of it before, but the invitation said Quang Ho would be the judge and keynote speaker? I'm so in. Also, a bunch of other solid artists said they were in, too. 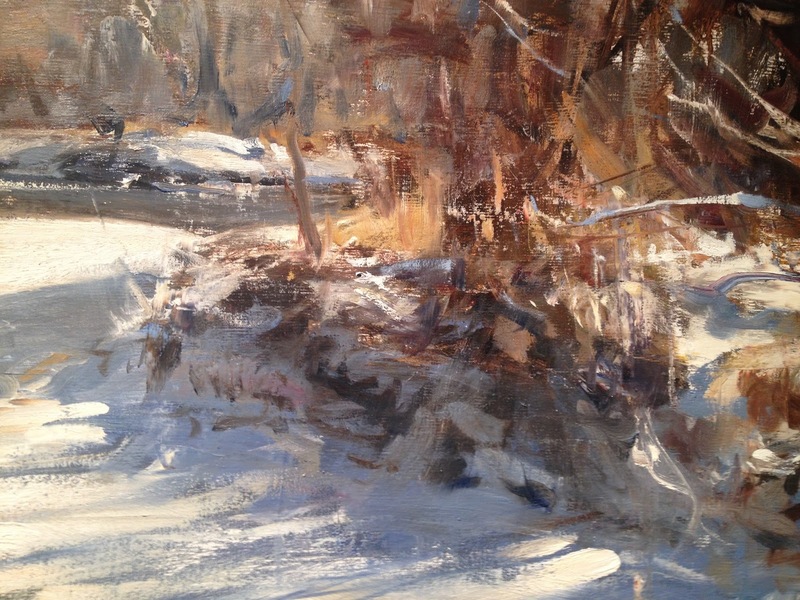 Here is the line-up: Jeff Bellerose, Kim Casebeer, Kevin Courter, James Crandall, Carolyn Hesse-Low, Tim Horn, W. Truman Hosner, Paul Kratter, Ann Larsen, Ruo Li, Carolyn Lord, Kim Lordier, Terry Miura, Robin Purcell, Glenn Renell, Kate Starling, Bryan Mark Taylor, and Elizabeth Tolley. Great group! With this caliber of artist, it's no surprise that the event was the success it was. By the way, the Signature Exhibition paintings are still available. We artists arrived at different times of the week to begin painting for the "Wet Painting Sale." 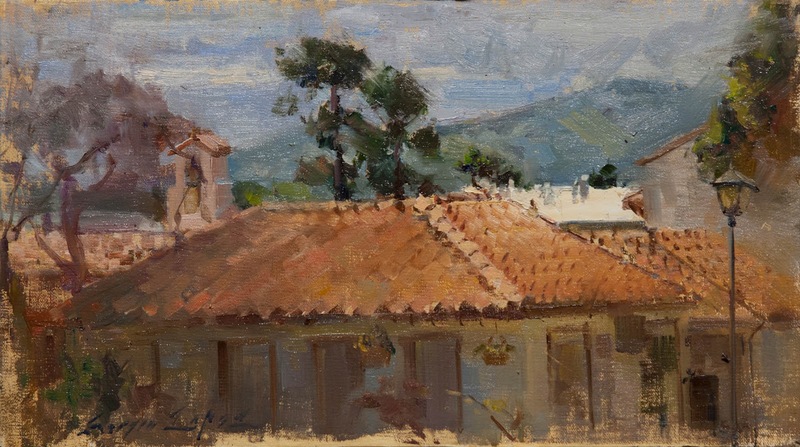 The first place I painted in the area was a scene on the outskirts of Santa Margarita. There was this amazing fog bank coming from the west over the hills that created an extremely unique effect. This was early evening where the light was nice and gold. 7x10 in. oil on linen board. Santa Margarita. 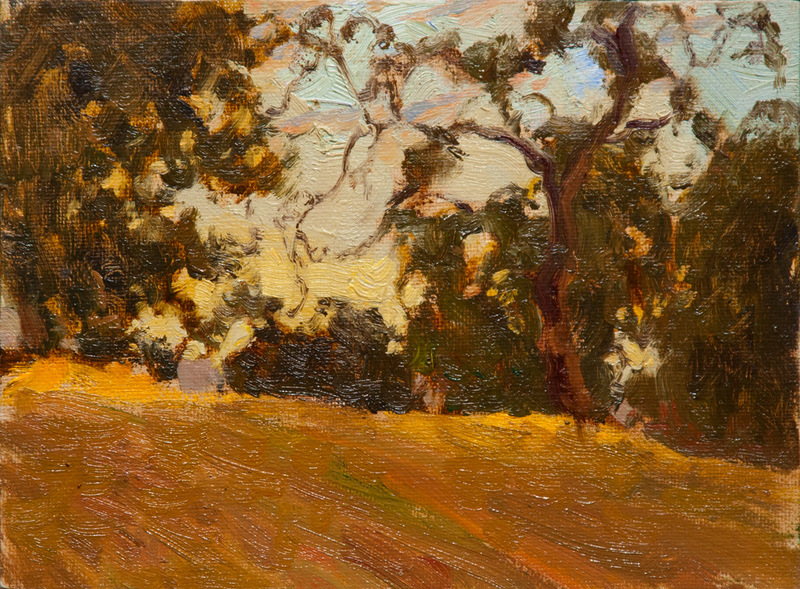 I went down the road from the first scene and did this extremely quick study of the rapidly vanishing evening light. I didn't think it was worth showing, but if I feel like it, I can make a larger painting out of the color info after better design of the shapes. Day two: The day was foggy in the morning. I find it hard to be motivated on a gray day to paint, especially when I know I can wait a few hours for the sun to come out. 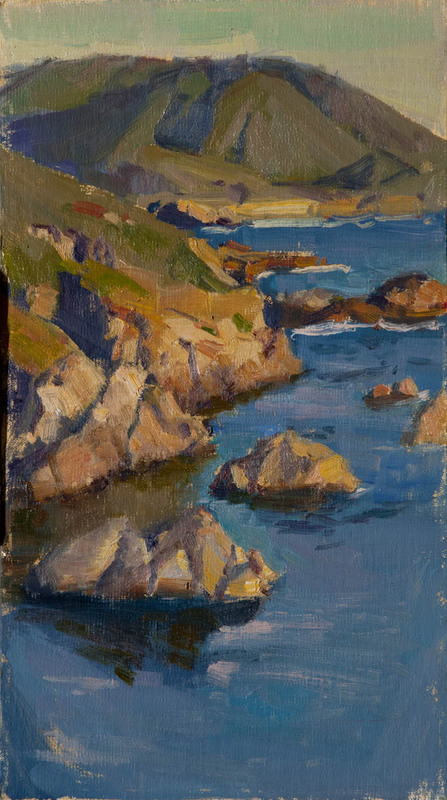 I am however, used to gray days on the coast, so I was comfortable with painting this scene in Morro Bay. This was painted at Bayshore Bluffs Park, a tiny public park tucked away from the downtown of Morro Bay. Charming little area. "Gray Shore Blues" 8x14 in. oil on linen board. Morro Bay. Here is a scene of those very characteristic hills of Central California. Are they limestone? 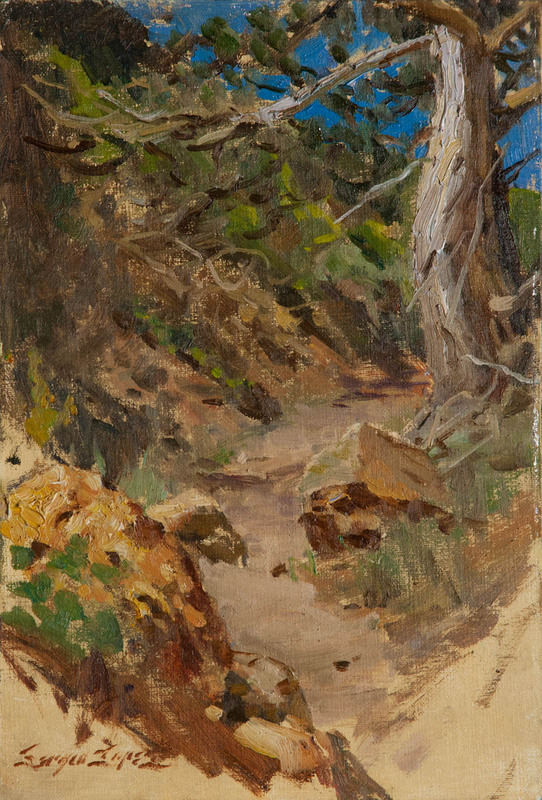 I painted this from a beautiful little nature preserve in Los Osos. 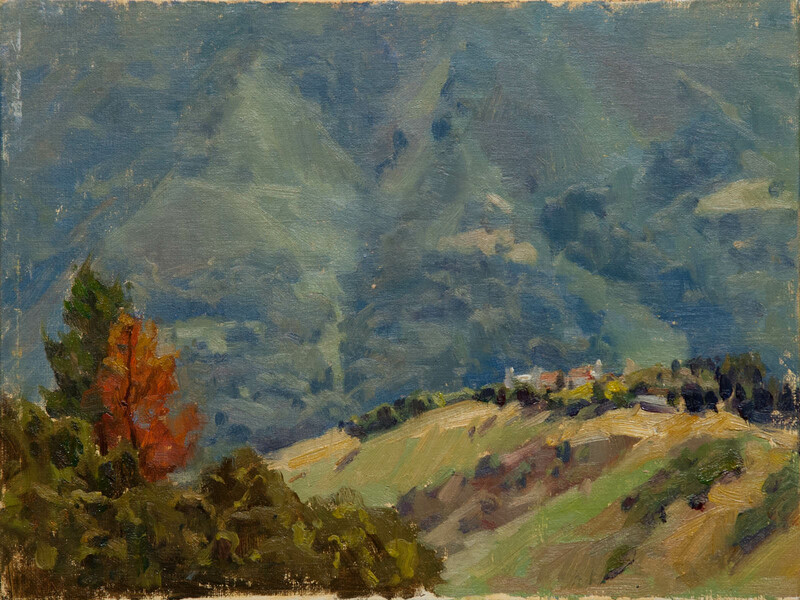 "Los Osos Hills" 6x6 in. oil on linen board. SOLD. 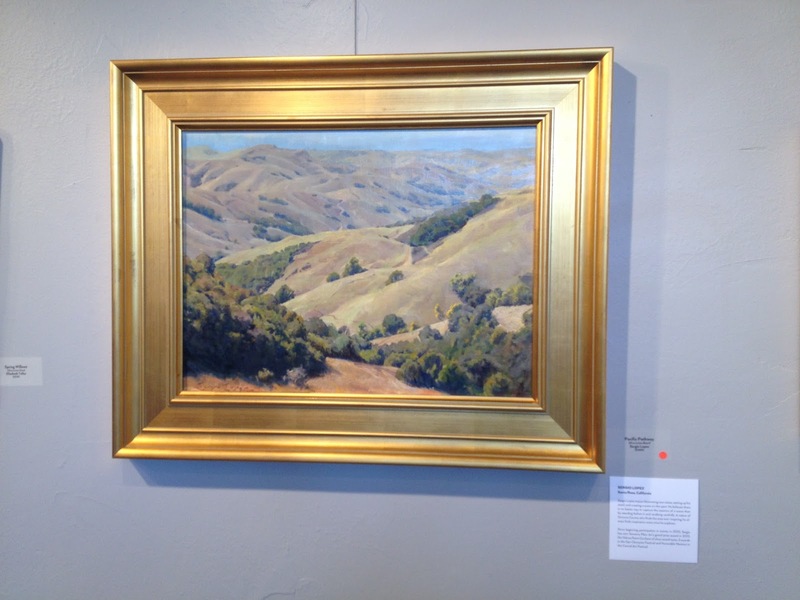 On my way back to Paso Robles, I stopped by my new gallery in San Luis Obispo, Just Looking Gallery. 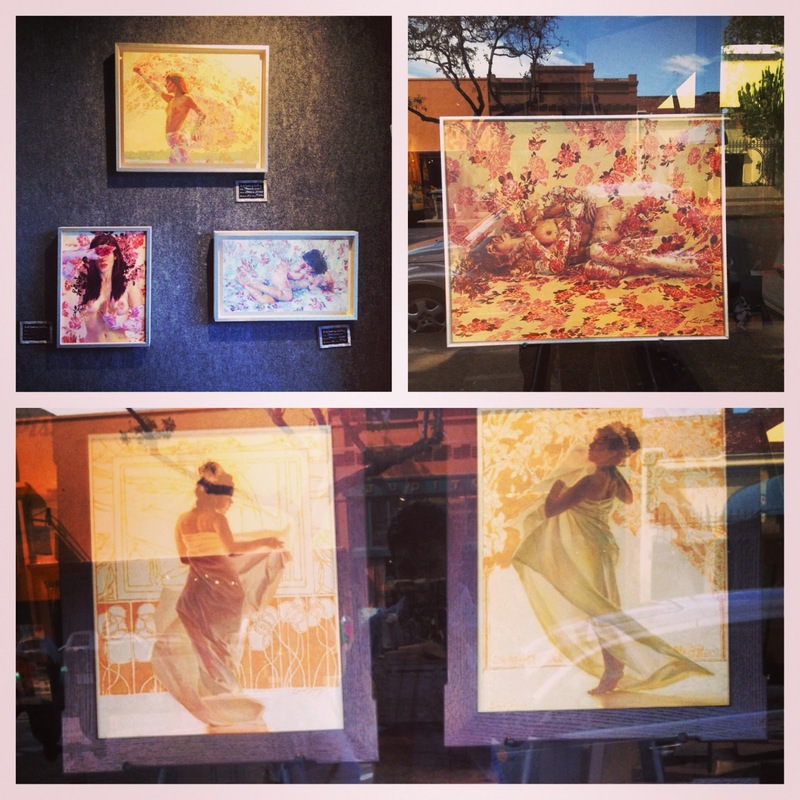 They are doing well for me, and they have my work in the front windows. Check them out if you're in the area. I couldn't get into a good painting groove for the rest of the day. Nothing was inspiring me enough to want to stop and paint before the VIP Welcome Party. Instead I took it easy for the rest of the day and then went to the Beckett Estate(owners of the Peachy Canyon Winery). They have an amazing view! Day Three: I drove out to this small pond I found last time I came to the area, along Chimney Rock Road. 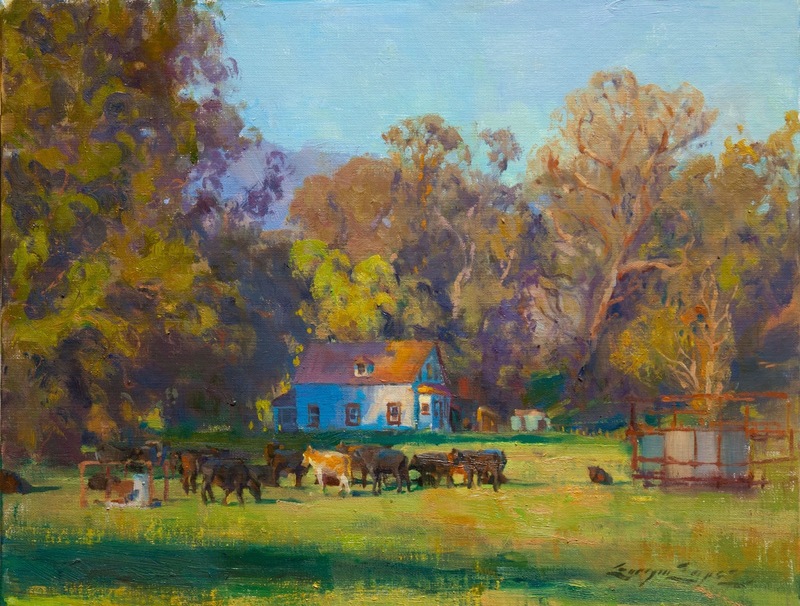 It was a gorgeous warm day with nice haze to it, the condition I love to paint in. "The Long Pond." 10x16 in. oil on linen board. Paso Robles. SOLD. 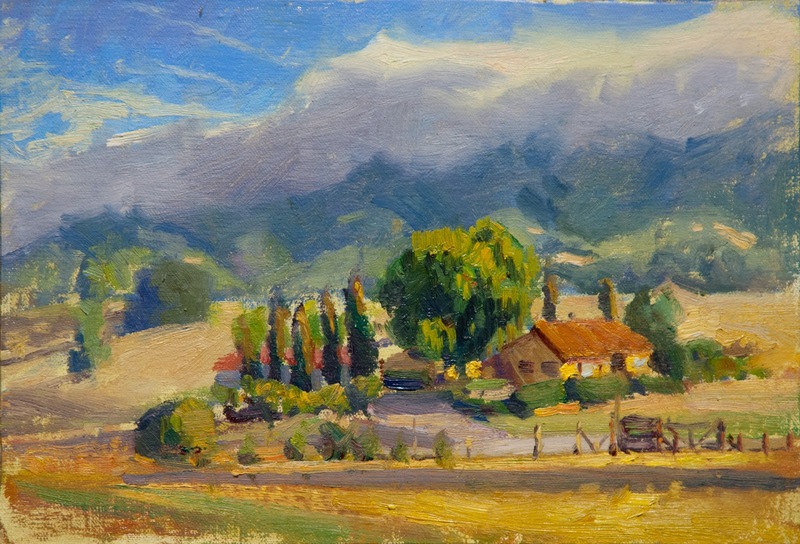 I had heard that Pasolivo was an especially scenic property to paint. It wasn't so much to my taste, but after hunting around for a while, I found a somewhat unusual composition to go after. I am trying to stay away from too simple/obvious compositions when I can. 8x10 in. 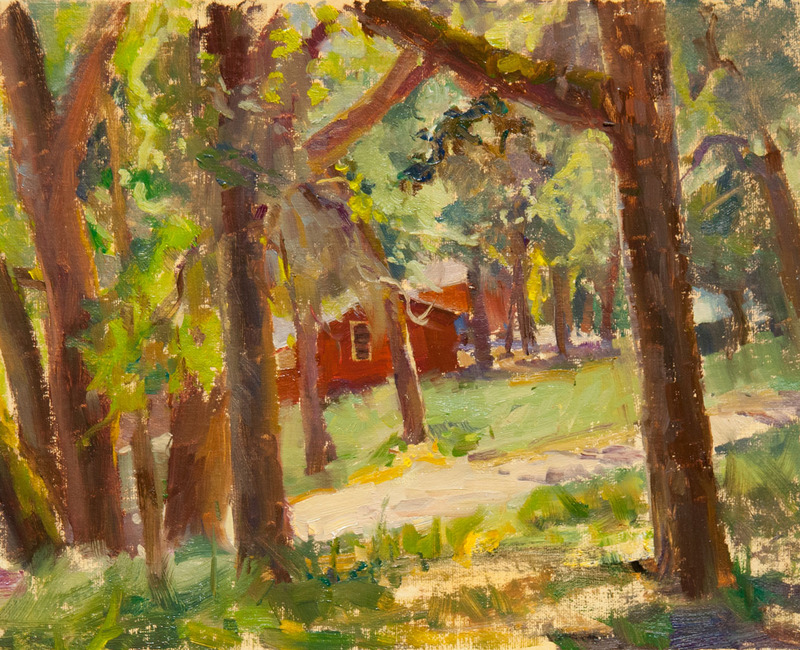 oil on linen. Pasolivo. This was the last painting I did for the show. I came across a killer view of the hills going west from Adelaida Road. It had everything I like. "Sister Hug" 12x9 in. oil on linen board. Adelaida Rd. Paso Robles. I got back to my hotel with just enough time to shower before going to the VIP Dinner that featured Quang Ho's keynote speech. It delivered! 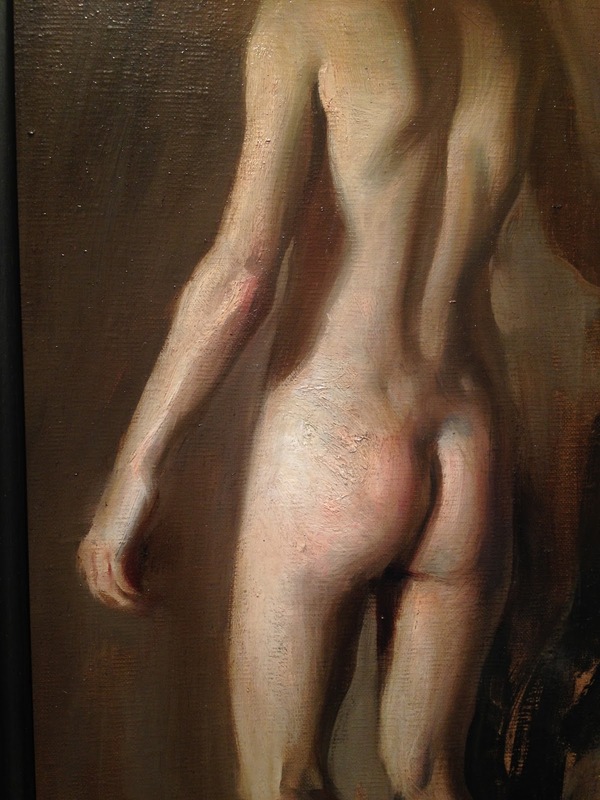 I found it fascinating, and visually breathtaking on account of all the paintings of his in the slideshow. He was very inspiring. He also announced the awards of the Signature Exhibition. 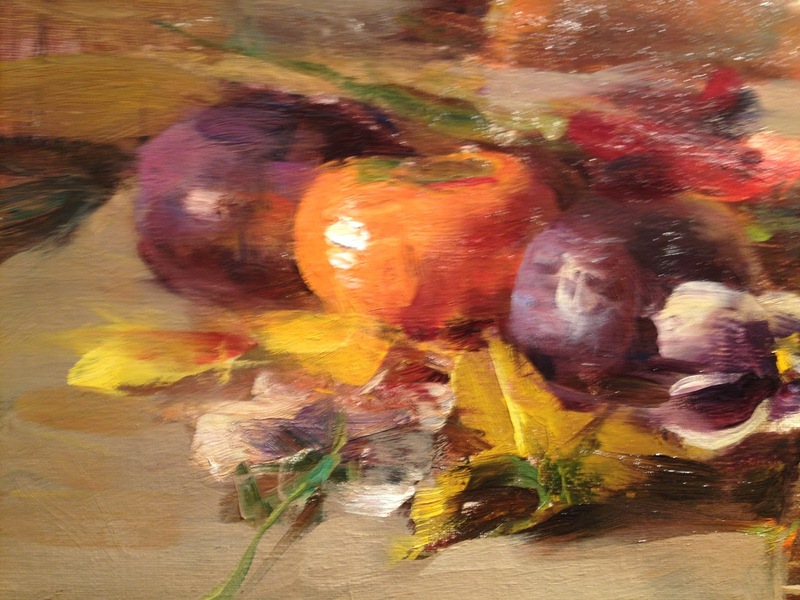 W. Truman Hosner won the Best of Show honor for his outstanding body of work. 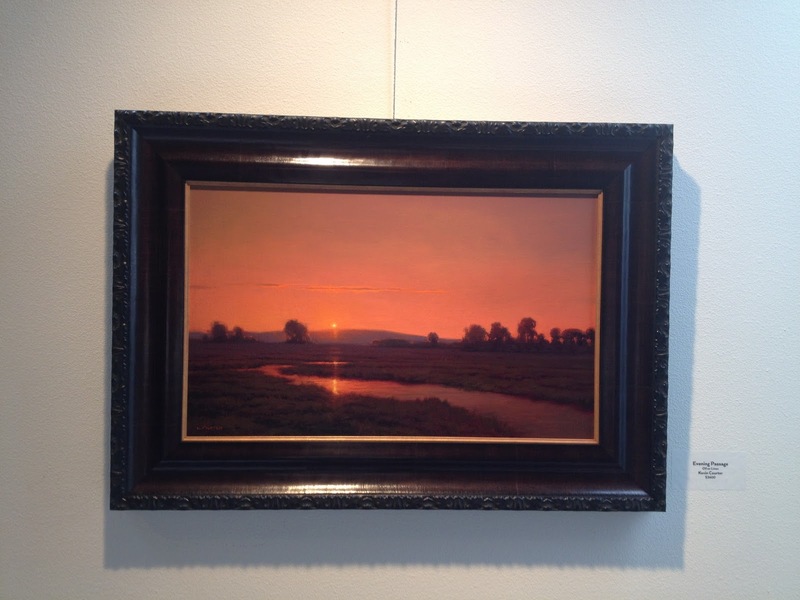 I was stunned to win an award for my painting, "Misty Hills." He also had this to say about my work: "Keep an eye out for this young man. He is a 'painter'. 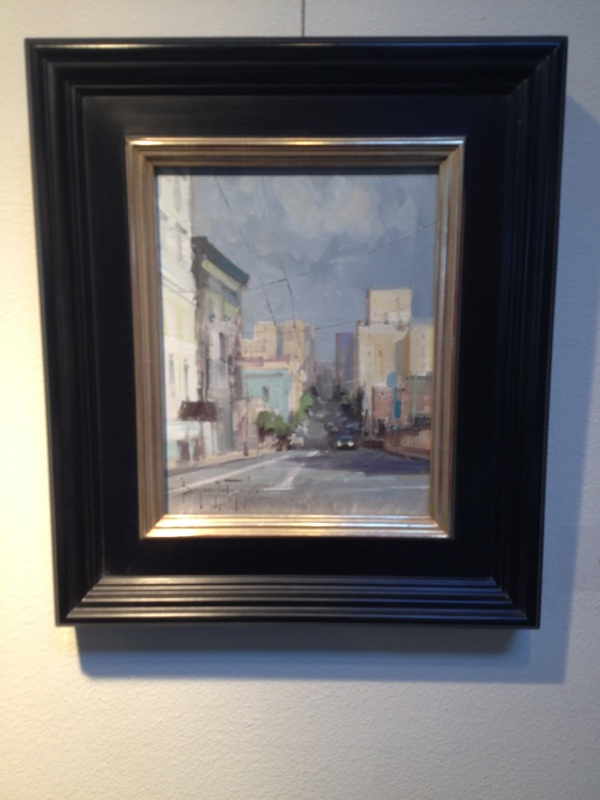 I love the liquidness of your paint and the tonal control of that painting was outstanding." Let me tell you, when Quang Ho says this about your work, it's a really good feeling. We went over to the Studios On The Park building to check out the show. 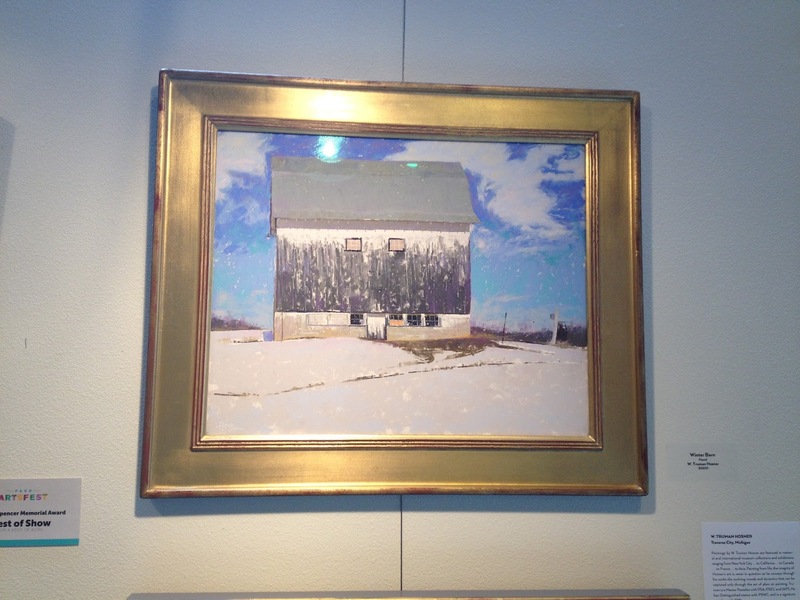 Quang Ho had some of his paintings on display. Check out these closeups. Even the crops hold up as paintings. So much good painting going on! Here are a few of the paintings from the show. 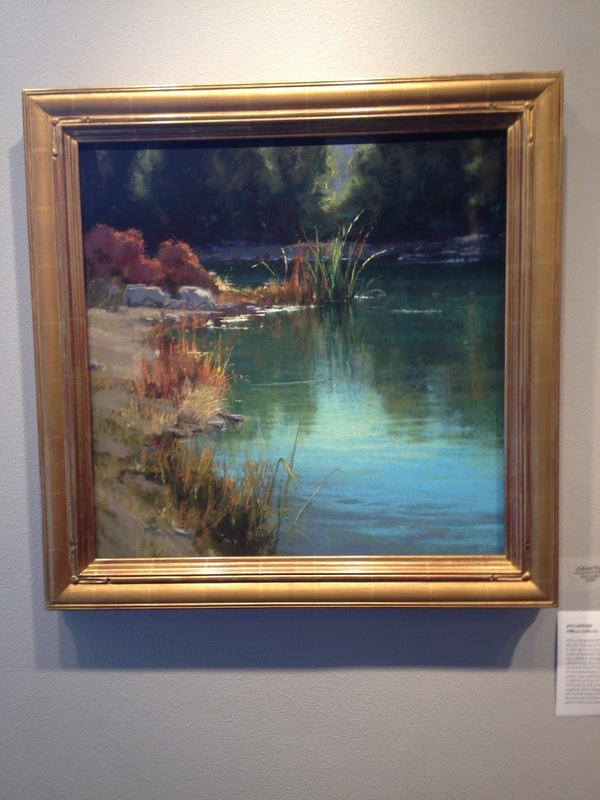 Make a stop in Paso Robles if you can to check it out, it's one of the best landscape shows around right now. The live auction happened on the day of the Wet Painting Sale(Saturday). Oh boy, hold on to your hats. You need some strong nerves to be able to put your ego up on the chopping block. Can you handle if your painting doesn't fetch a high price? It will be there for everyone to see. The way it worked was that you are supposed to set a minimum reserve price for the painting you offer for the live auction. The reserve needs to be met to be able to sell to the bidder. Once it's met, sky's the limit, although most fell around the $600 to $900 range. A few went over the $1000 wall, but not a whole lot beyond that. My strategy was to offer a painting that was characteristic of the area (Sister Hug) that might have trouble selling elsewhere. I used the benefit of the auction setting to my advantage. It is almost a guaranteed sale, as long as the painting is strong. So I put up one that not only isn't too expensive normally (<$700) I had a feeling could fetch a decent price and was happy with only meeting reserve price. If it didn't hit the reserve, then I could be certain that no one was going to buy it full retail anyway. My painting was the last one to auction, so I wasn't sure how it would go. Fortunately, not only was the reserve met, but it went $200 over the retail! So my strategy worked out this time. 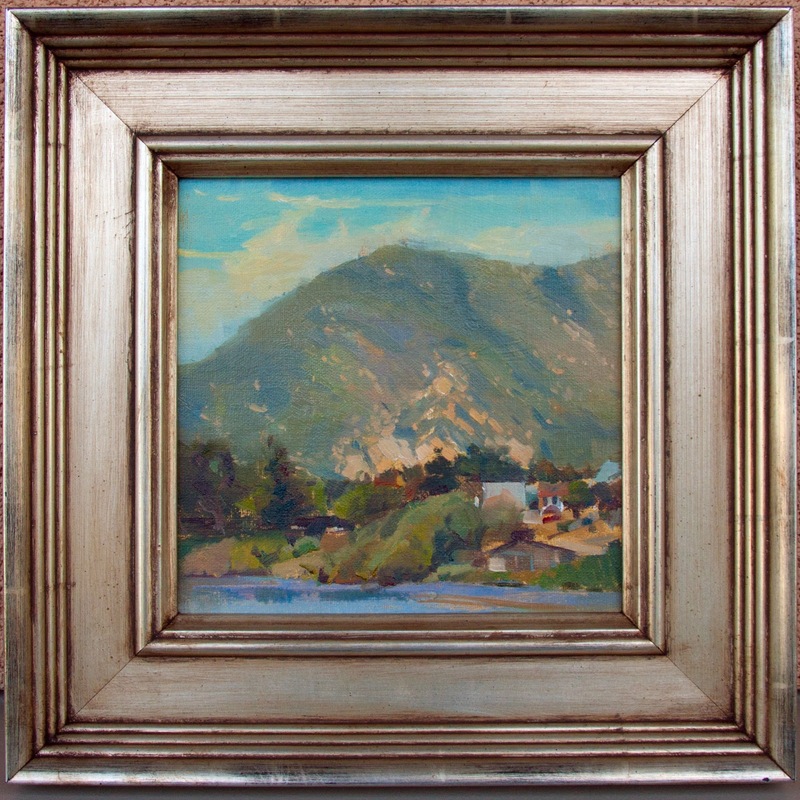 I think a live auction can work well as long as it's done this way, where everyone gets a shot at putting a painting up, instead of the Carmel Art Festival which only takes the paintings that already have more than 5 bids in the silent auction to the live auction. Overall, this event was a good success for me. I sold 4 paintings(including a large-midrange size one) so it was definitely worth it financially. I hope I am invited again for next year and they can manage to get a judge with the caliber of a Quang Ho again. The show is up until June 29th. I highly encourage you to make the trip to Paso Robles to check the show out if you can. It's one of the best landscape shows you'll see on the west coast this summer. I have returned from the Carmel Art Festival. 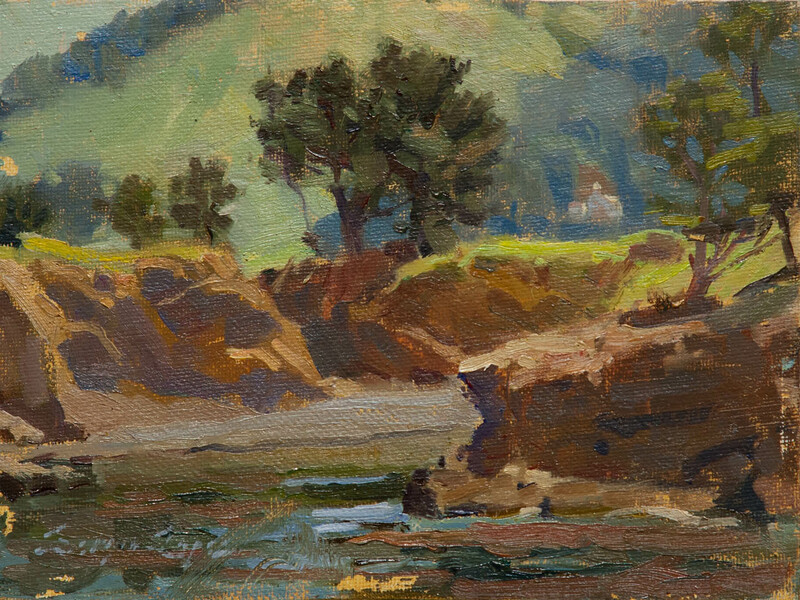 I had a great time painting in Carmel as usual, which is the main reason I do it. I did decently well with sales this year. I changed it up a bit and painted a bunch of small paintings. 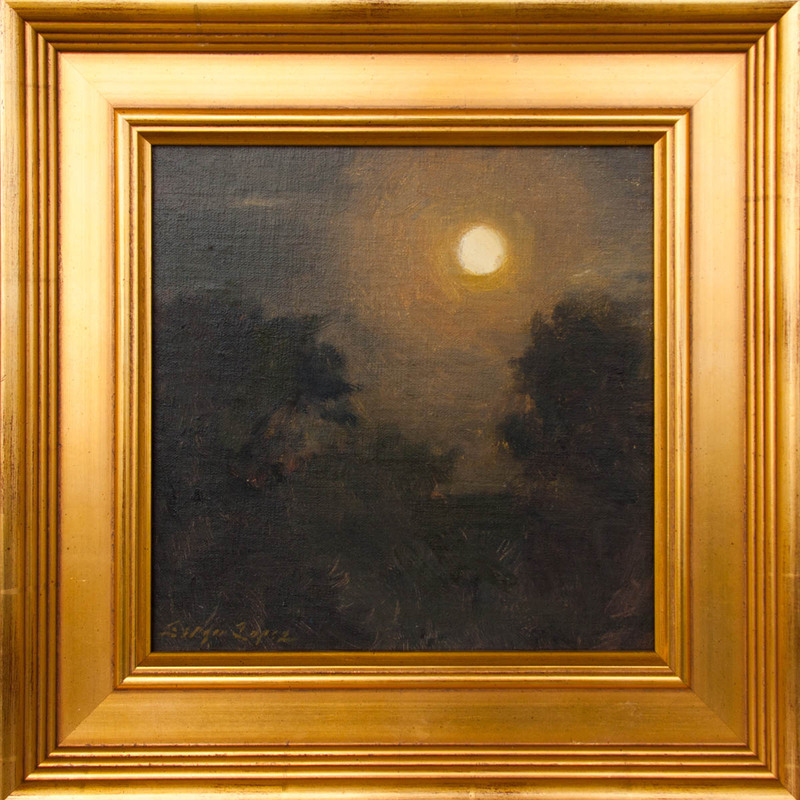 I wanted to see if a bunch of small paintings would be more enticing to buyers than hoping to win a prize with two large paintings, as is what seems to be the usual strategy. I checked in on Wednesday night (again, why they do evening check-ins I don't know) and went out to Lover's Point in Monterey. I won't show that painting here because it was a clunker, but it was nice to get away from the heat of the rest of California and be near the beach. Speaking of the beach, I painted a rare nocturne. The moon was so gorgeous, so I went down to Carmel Beach to do this painting in the dark, save for moonlight and my two booklights. Thursday was another perfect day with hardly any wind and almost no clouds and fog. That is extremely rare for the Monterey coast. 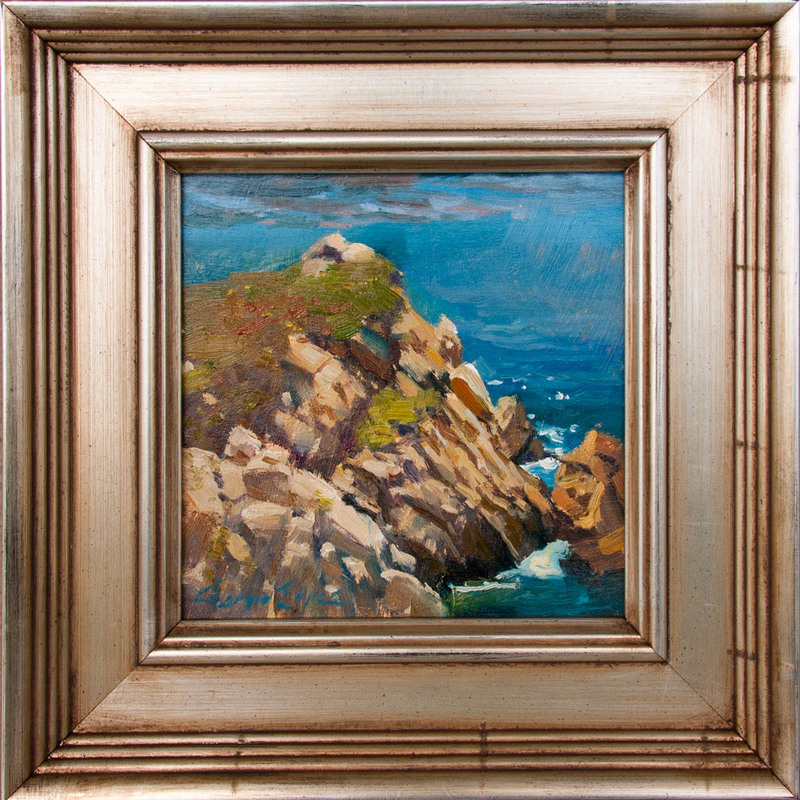 In the morning I worked up this 8x10 near a pullout in the town of Carmel Highlands. There are parts of it I like, but I could do better. 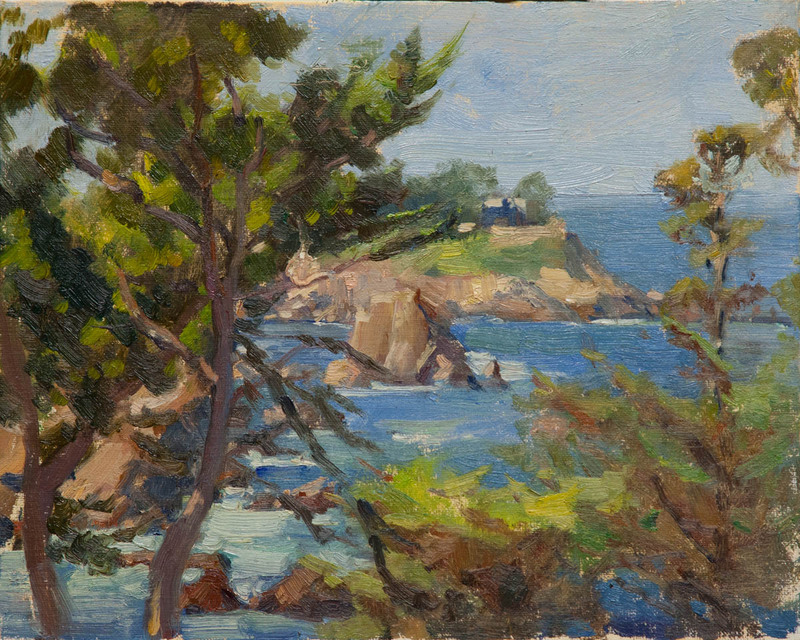 Next I went into Point Lobos to knock out a bunch of small paintings. This painting of Whalers Cove turned out to be pretty well-received. I thought it was fairly successful. I'm probably going to use it as a study for something larger. 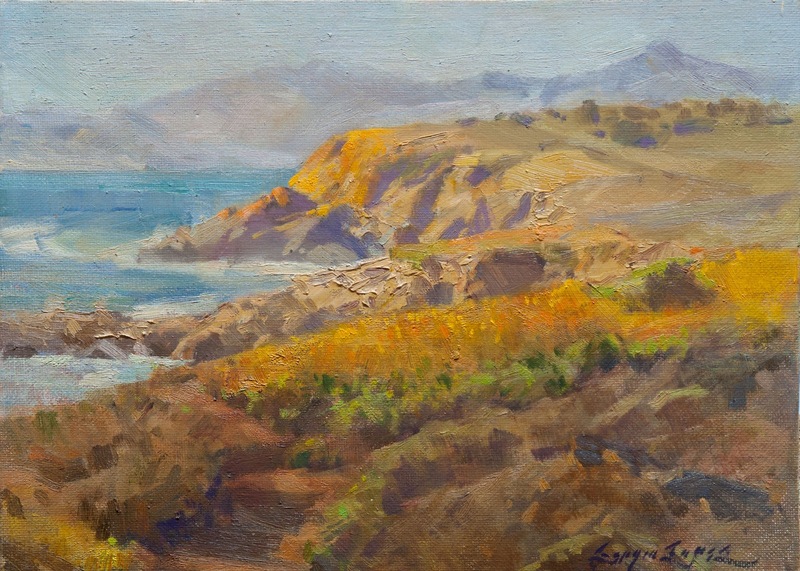 I hiked along the trail to the other side of the cove to paint from Granite Point. 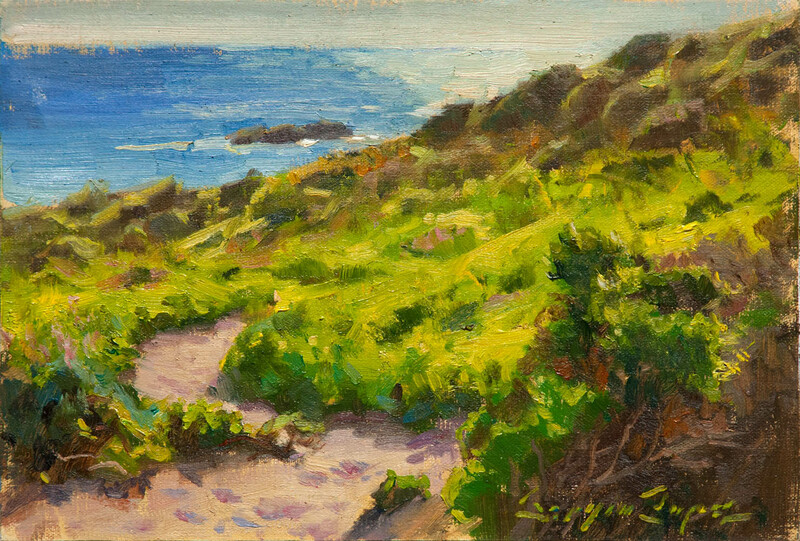 This part of Point Lobos is usually too windy to paint from comfortably. Fortunately, it was just perfect when I was out there. Although it was very complicated of a subject, I think I did ok with it, and so did a collector who purchased the painting. This is a painting that I've wanted to do for a while. I am planning on doing this one larger, and a slightly longer and narrower aspect ratio. There was a lot going on in this scene and it was hard to keep it from getting out of control, but I think the areas that are not full of texture give the eyes enough of a rest. This painting has grown on me since painting it. 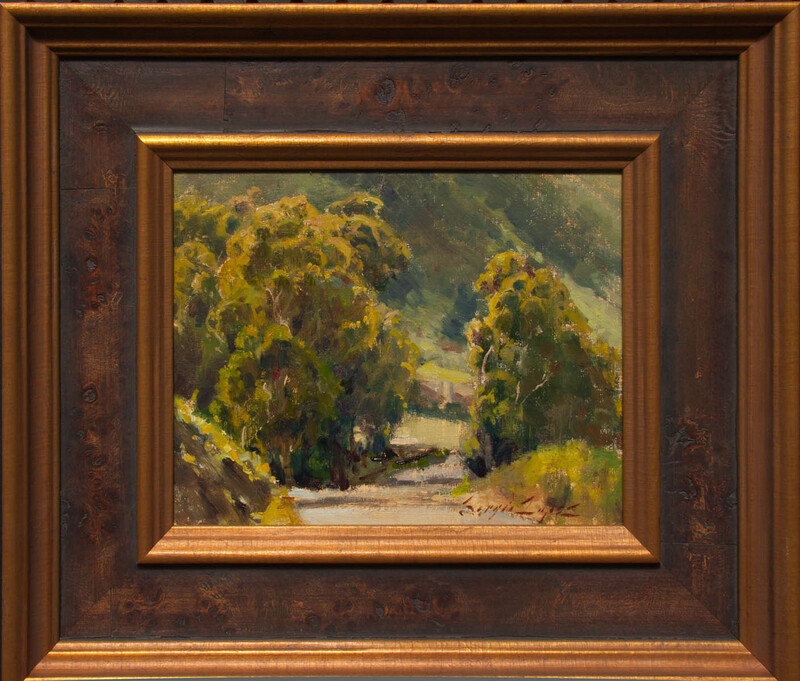 I was attracted to the greens of the foliage in the middle ground, but the light effect is what is attractive about the painting. This is on my list to paint larger. "Sea Greens" 7x10 in. 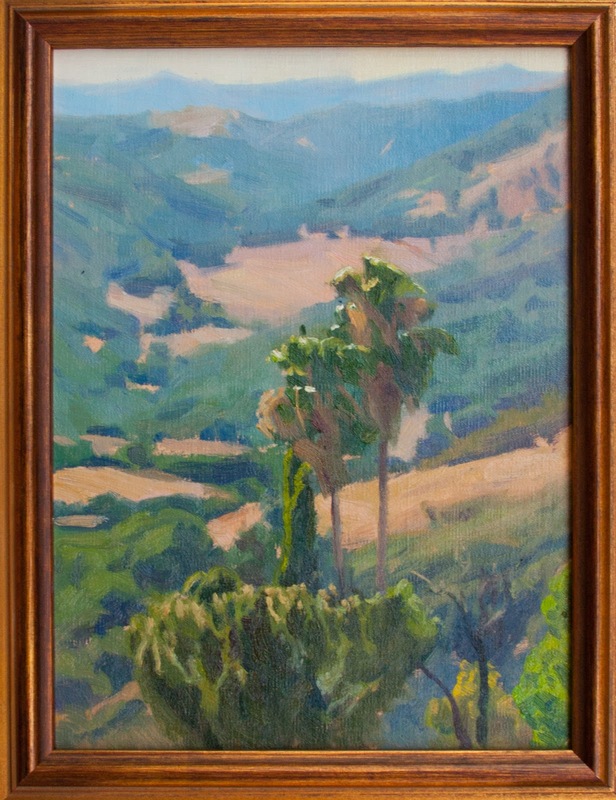 oil on linen. On the flip side, this painting has dropped in appeal to me since I painted it. I was too rushed in the amount of time I gave myself to paint it. The light and color is not at all reading like how I wanted it. It might work if I could have it in the same evening light, but obviously that won't happen. It's something I need more experience with, compensating for the color of the environment while painting. This was another scene I knew I was going to paint for the show. 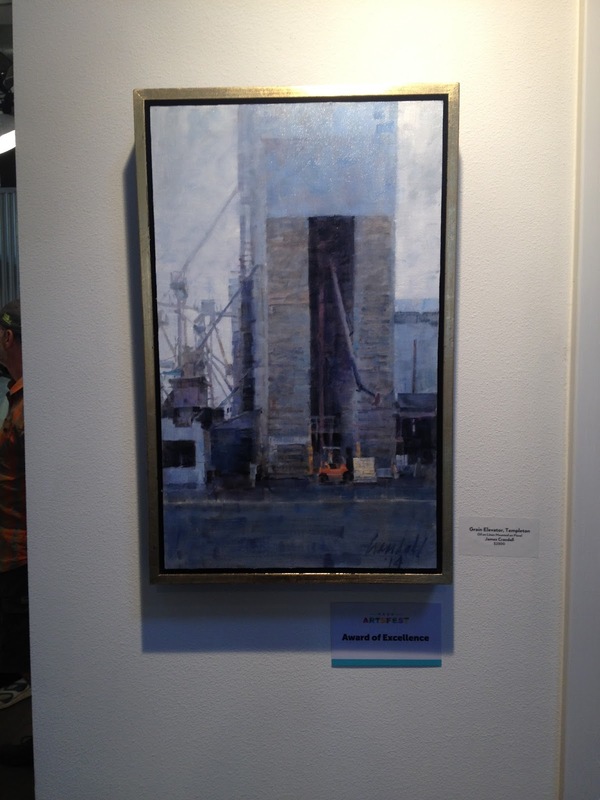 My enthusiasm for the subject matter and light I'm sure was evident to the judge John Burton because he gave me an award for it. It also sold a few hundred dollars above retail price! I noticed this year that most of the award winners fetched a lot of bids whereas it was slim pickings with everything else. 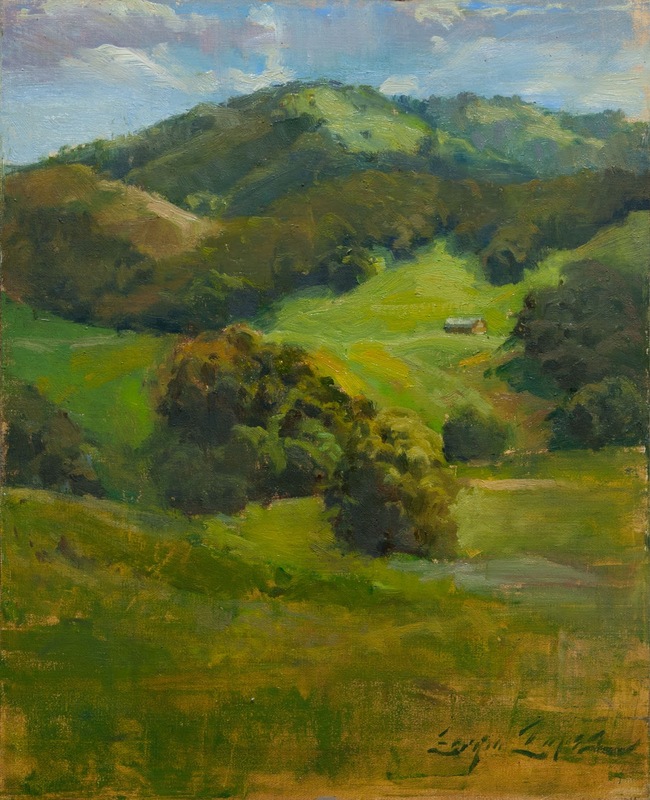 I love Garland Ranch Park, it's one of my favorite places to paint in the area. However, the dead of noon is one of the hardest part of the days to paint. The shadows are flatter, the color is bleached out, and it's hot too. I hunted around for a view that had a decent light and dark pattern so I peeked through backlit trees to the view east. There was a lot going on with the foliage. If I had the time I would have worked the background one day, and the foreground the next. 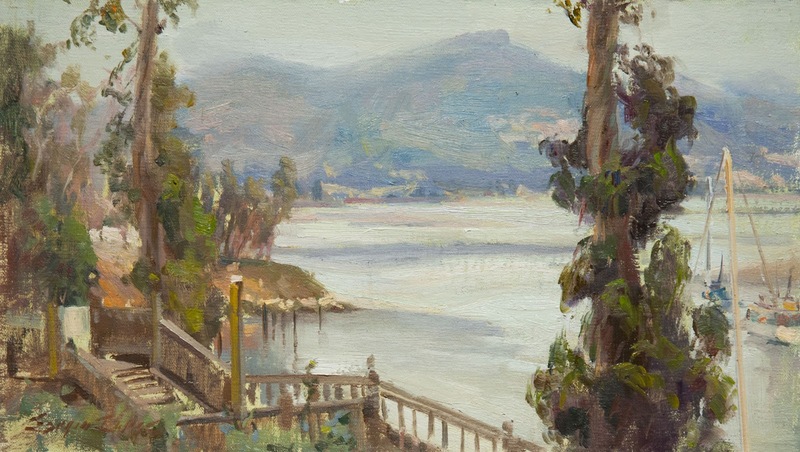 This was another painting that I feel would need a couple of days to study the view. There is a lot going on in the background, a lot of really subtle color temperature shifts. I think I need to tone down the reddish tree in the foreground too. But I think it would make an awesome large format painting. On Saturday we have most of the day to do some more painting. 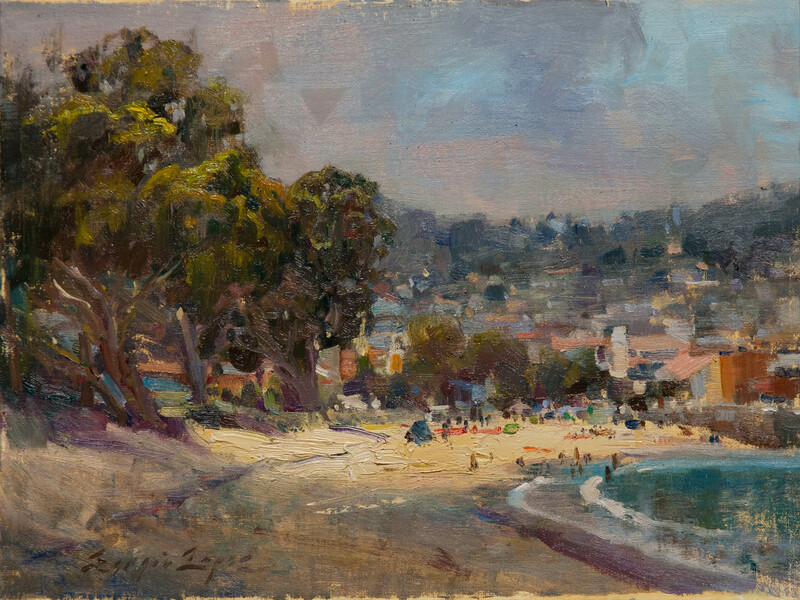 I went to Monterey Beach and painted a lively scene of the beachgoers. There were moving clouds that made a nice spot of light that helped the design. I pushed the pinks and peaches in the scene. I had a hard time choosing a subject for Sunday's quick draw. It was overcast, and most of the street scenes were flat and gray. I didn't feel like painting at the beach, but I was running out of options. I settled on this scene of the rooftops. I was attracted to the hills in the distance, and the light on the white roof. I didn't have a chance to work out the composition as well as I wanted to and it bit me in the long run. I had to repaint the entire left side and re-establish the light-dark pattern. I was really flailing at one point. I don't love the final result but I think I salvaged it enough to not feel totally embarassed about it. 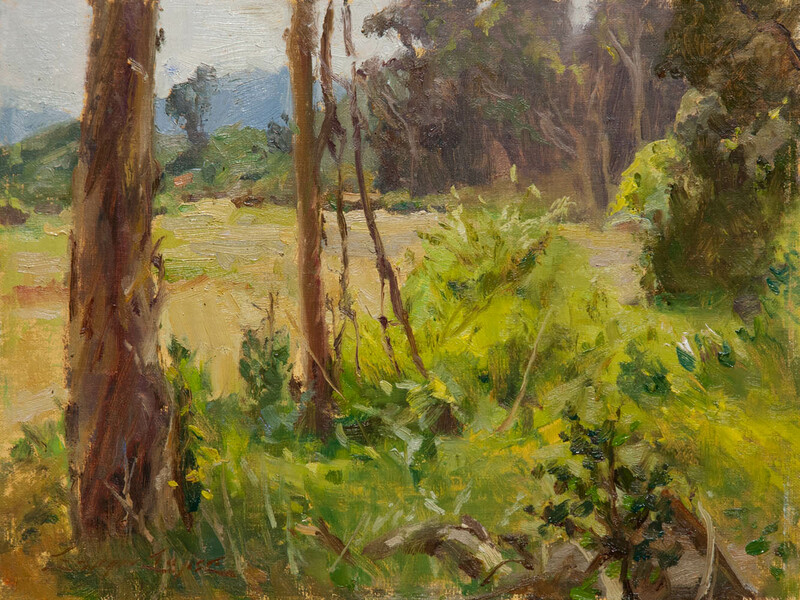 It also speaks to the importance of being psyched about the subject matter when plein air painting. And so goes another year for the Carmel Art Festival. Myself, I did a little better than last year, and therefore better than I ever have in the 3 years of participation. I noticed less people looking at the art this year. I don't know if they've let certain things go as far as advertisement goes, but it kind of goes to show that keeping up with advertisement is important to have fresh buyers. You can't rest on your laurels if you want to continue your success. I hope the organizers of the event realize this and invest more effort into getting the word out about a really good show. 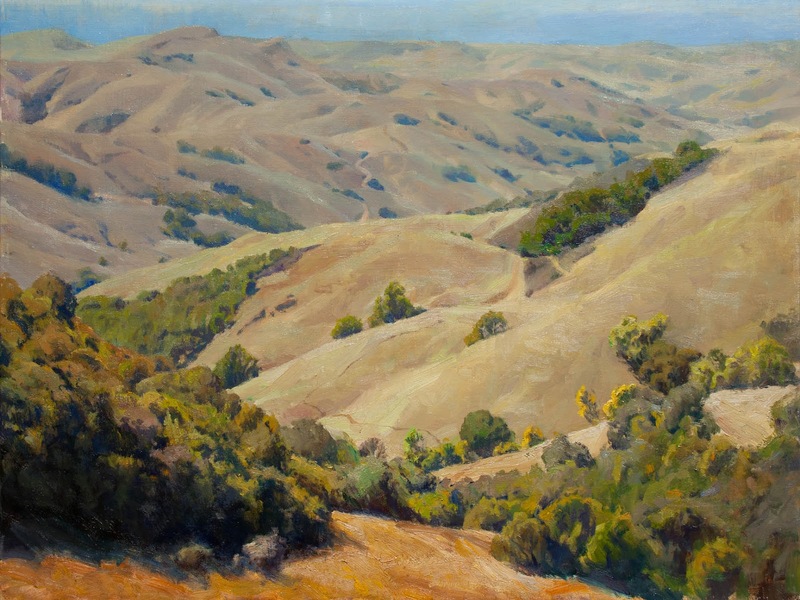 I love the San Luis Obispo area and am very much looking forward to painting there. 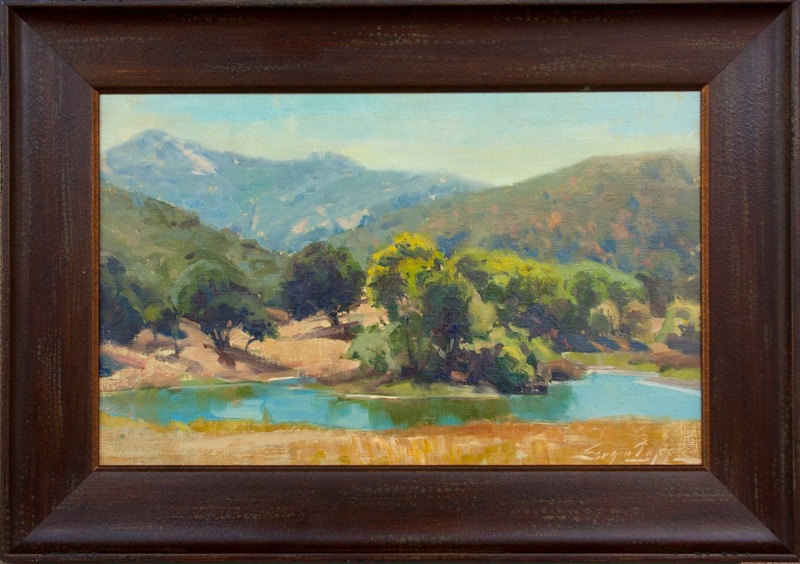 If you are in the Central California area, please come by and check out the Wet Painting sale Saturday the 24th.